MB Crusher has launched the 4th edition of the MB-S14 screening bucket. 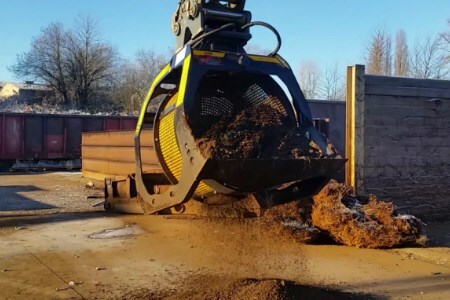 A German company that owns a demolition depot, experienced the accumulation of tonnes of material - a mixture of earth and debris – which needed to be separated. It was therefore necessary to arrange and rearrange the areas, cleaning the inert materials with equipment that would allow maximum productivity in a short time. The decision fell on the MB Crusher screening model MB-S14 that was purchased to work on a Liebherr 900 excavator. Equipped with a panelled basket with 20x20 mm holes, the MB-S14 screening bucket allowed the company to manage the work area in just a few days: the soil was effectively separated from the larger debris and bulkier pieces of material, and the resulting inert material was gathered in an orderly manner. Using the MB-S14 screening bucket, the customer was successful in obtaining clean material, which was capable of being marketed and gaining wide profit margins. Today, the company screens over 15 tpd of material. Designed to work with excavators from 9 - 20 t, the MB-S14 screening bucket is now effectively deployed in the 4th Series of MB Crusher products. It weighs 1.10 t and has a loading capacity of 1.10 m3. It is compact with dimensions of 1700 x 1400 x 1440 mm, and has baskets made of interchangeable modular panels, which are available with various sized holes as needed. New clamps for locking the panels, interchangeable and more durable. Structural optimisation, which reduces panel replacement times. New generation transmission, for reliability and durability. New central greasing system to reduce maintenance times. Improved strength equilibrium between the digger’s arm and the screening bucket, thus increasing productivity. Improved reliability thanks to the use of special material and robotic construction techniques.